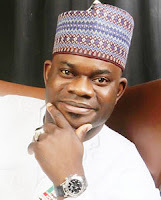 Yahaya Bello Adoza was born on June 18, 1975 in Agassa, Okene Local Government Area of Kogi State to the family of Alhaji Bello Ipemida Ochi and Hajia Hawa Bello Oziohu. He is an indigene of Kogi State and the last born of six Children begotten by his parents. He is married and blessed with children. Yahaya Bello Adoza also popularly known as Fair Plus is an astute business man and the Managing Director of FairPlus International Ltd and also the Director of Kogi Youth Arise Forum. He began his primary education at LGEA Primary School, Agassa In Okene LGA in 1984. He thereafter proceeded to Agassa Community Secondary School, Anyava , Agassa-Okene. He however did not conclude his secondary education there. He changed school severally until he finished from Government Secondary School, Suleja-Niger State. He entered for his ‘A’ level exams in Kaduna State Polytechnic, Zaria in 1995 and gained admission into Ahmadu Bello University(ABU) Zaria in 1996 to study accountancy. He graduated with a degree in accountancy in 1999. Yahaya bello pursued his career further by obtaining his Masters in Business Administration(MBA) in 2004 still from ABU, Zaria. He is also a chartered fellow of Association of National Accountants of Nigeria(ANAN). Yahaya Bello had his one year compulsory National youth service in 2001 where he was posted to Revenue Mobilization Allocation and Fiscal Commission (RMAFC). He was thereafter retained and offered appointment as Revenue Officer II. His dedication to duty and hardwork singled him out for promotion to accountant in a very short period. He was later transferred to head the Makurdi Zonal office Account Department. He has worked in various departments in the office and rose through the ranks to the position of Assistant Chief Accountant. Over time, Alhaji Yahaya Bello mastered the art of stock trading and had a financial breakthrough right before the crash of the stock market. His stock portfolio investments cut across oil and gas, finance, transportation, and agro related sectors. He then grew and expanded his real estate investments expanding into a number of states in the country. It is worthy to note that his various businesses helped facilitate job opportunities for a number of unemployed graduates and youth particularly Kogi State indigenes. Alhaji Yahaya Bello has embarked on several acts of philanthropy. He funds three orphanage homes and sponsors hundreds of Kogi State undergraduates in various higher institutions both within and outside the country. His need for community development inspired him to invest in various community projects. He has as his hobbies: reading, traveling, driving, soccer and boxing. He began his political journey by joining other progressive young men and women to form Kogi Youth Arise Group. This group threw its weight behind the candidature of Buhari/Osinbajo in the last presidential election. This group was also responsible for mobilizing youths across the 239 wards in the State in support of President Buhari. With the teeming support from youths across the state for one of their own to lead Kogi into a brighter future, he presented himself to vie for the position of Governor in the gubernatorial election of 2015 under the platform of the All Progressives Congress (APC). His mandate however came about after the death of Audu Abubakar, the winner of the 2015 Governorship elections who died of a heart attack shortly after the declaration of the election results announcing him the winner. An appeal filed by James Faleke, the running mate to the deceased APC governorship candidate in Kogi state, Abubakar Audu, aimed at nullifying the adoption of Yahaya Bello as the APC candidate in the recently concluded state's governorship election has been dismissed by the Appeal court at Abuja. Falake was running-mate to Abubakar Audu before Abubakar's demise. However, after Abubakar Audu suddenly died on November 22 , 2015, Yahaya Bello replaced him as the APC’s candidate for the state’s governorship election. This APC's decision to adopt Yahaya Bello as candidate to inherit votes that already accrued to Abubakar and Falake in an inconclusive election was challenged in court by Falake. The issue before the court was that the votes polled by the party in the election belonged to Falake since he was the running mate of the late Abubakar Audu. While delivering judgment the court of appeal appeal on August 8, 2016, through Justice Jummai Sankey ruled that Section 221 of the Nigerian constitution provides that it is only the party, and not an individual, who can canvass for votes. Justice Sankey in the same ruling further stated that Nigerian constitution does not take cognizance of independent candidature and consequently, Faleke cannot lay claim to votes polled before the demise of Abubakar Audu and after the election was concluded. The learned Justice of the court of appeal further held that Faleke was only paired with Abubakar Audu after the primaries had been concluded whereas Yahaya Bello participated in the primary election that produced Audu as the party's flag-bearer. Moe news from KOGI STATE?